Thanks to all our wonderful modern gadgetry, there are any number of ways to keep yourself and your kids entertained on long journeys; play a game on your phone, watch a movie on your tablet, and even if you’re driving you can still indulge in a little literary therapy, courtesy of an audiobook. Indeed, for many adults a long journey can sometimes feel like a welcome opportunity to have a few hours to yourself, consume some of your favorite media, or even catch up on a little work. But for kids it can be an entirely different story. Do you remember when you were just 5 years old, and a minute could stretch out for an hour, and a 4-hour car ride could quite literally feel like the never-ending journey? Back then the options for entertaining oneself were much more archaic, but we made the most of it, created our own fun, and perhaps even ended up enjoying car journeys and all of the things that came along with them! For this very reason, you might not want to just hand your kids an iPad and leave them to their own devices (pun intended). You might prefer to fully immerse them in the quintessential family experience- the long car ride. If this sounds like you, then it’s time to get retro with it- ban technology from later than 1990 and take a trip down memory lane instead. Here are some of the best ways to keep your kids entertained on long journeys. As entertaining as you try to make long car journeys for the kids, taking regular breaks can really help to spread out the journey for them (and you!). No one likes to be cooped up in a tin can for too long, and all involved will enjoy the opportunity to get some fresh air and ‘use the facilities’. This can be especially important for kids that are seated in rigid booster seats, which can contribute to uncomfortable ‘dead legs’, so giving them a chance to stretch their legs, can be particularly welcome. Anyone with a kid that’s reluctant to take in fluids will be well versed encouraging them to drink at home, but it’s equally important to do this on the road, and it’s easy for hours to slip by quickly. Make a point of encouraging kids to drink a few sips every half an hour or so; it will make them feel more comfortable, and ensure good hydration when they arrive at the final destination. This is also important from a safety perspective; a comfortable child is less likely to wriggle into a dangerous position, like putting their arms over the top of their restraints. 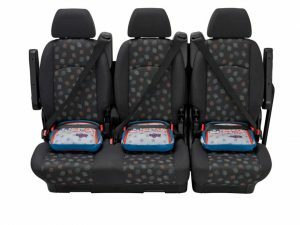 Some rigid booster seats designed for older children (4-11) or group 2 and 3, have hard plastic sides which can be uncomfortable for kids during long journeys. The BubbleBum inflatable booster seat offers a comfortable alternative. It’s flexible, soft, and has memory foam inside which provides extra support and comfort. Most importantly it provides all the safety benefits of a rigid booster seat, but with added portability and compactness. You can fit 3 kids across the back seat too, which is a nice bonus! It’s also important to make sure the temperature inside the car is comfortable for kids, bearing in mind that their bodies are more susceptible to fluctuations than the average adult. In modern cars with precise temperature controls, this is quite straightforward, but if you drive an older vehicle or one with inadequate air conditioning, you’ll need to pay closer attention. 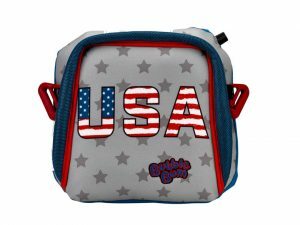 3 ‘Stars and Stripes’ BubbleBum booster seats, side-by-side. Okay, so technically, this does contravene the ‘no technology’ rule, but it has a potential for education, so it should be fine. This is especially good for older kids, as it’s fun and gives them an opportunity to develop some navigation skills without even realizing it! Open Google maps on your phone and hand it over to them. Set them some tasks like finding the nearest gas station, deciding which direction you need to go next, identifying local landmarks, or working out how long it will take to get to your destination. It also means that when they ask the inevitable ‘Are we there yet?’, you can quickly respond with ‘You tell me!’. For some kids, long car journeys can be more than just boring, they can be really frustrating. Whilst taking steps to inject some fun into the journey can make a difference, simply keeping the kids informed of where you are and what’s happening next can help provide some structure and a sense of purpose to the journey. The license plate game is an old favorite, and for good reason, but there are some other excellent games which can be amended to suit kids of different ages. The best of these are the ones that get kids to interact with or make observations about the environment whizzing past their window. Something like I Spy is a great choice for younger children because it’s simple and easy to learn, whereas more complex games such as 20 Questions will keep older kids entertained on long journeys. Of course, you can always pick up an inexpensive travel version of a classic game like Monopoly, Connect 4, or Battleship, but there’s something gratifying in being able to create a game which requires no equipment whatsoever. 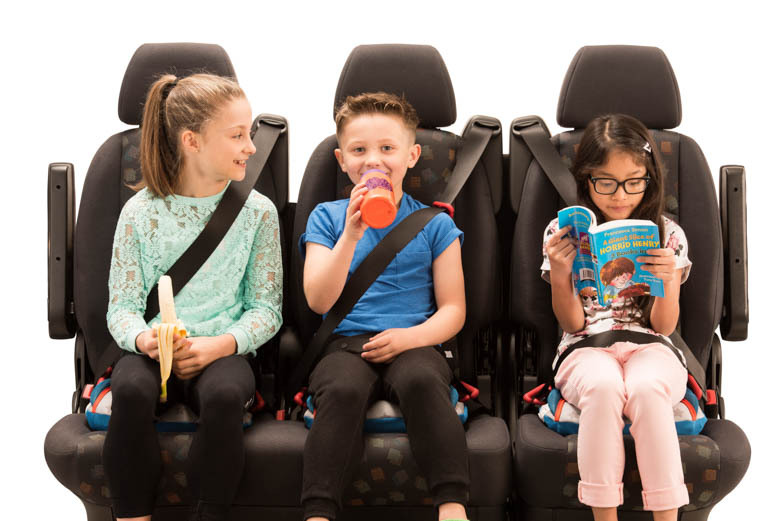 Let us know how you manage to keep your kids entertained on long journeys, and don’t forget to pick up a BubbleBum booster to keep your little ones safe and comfortable on long journeys. BubbleBum Booster Seat ‘Stars and Stripes’ edition.